PowerSchool 是學生資訊系統 (SIS) 整合搭配學校資料同步 (SDS)。PowerSchool is a Student Information System (SIS) that integrates with School Data Sync (SDS). 使用 PowerSchool 同步處理方法，可以直接連線到您使用 PowerSchool，所提供的 rest Api 的 SIS，並直接而不是使用 CSV 檔案資料同步處理。Using the PowerSchool sync method, you can connect directly to your SIS using the REST-based APIs provided by PowerSchool, and synchronize data directly instead of using CSV files. 若要設定 SDS 使用 PowerSchool 同步處理方法，請遵循本文中的詳細指示。To set up SDS using the PowerSchool Sync method, follow the instructions detailed in this article. 您透過 School Data Sync 提供的資料可能是存取他們的應用程式，透過協力廠商應用程式提供者，所以您應該同步處理您想要提供給這些協力廠商的資料。The data that you provide through School Data Sync may be accessible to third-party application providers through their apps, so you should sync only the data that you want to make available to these third parties. 之前 SDS 可以從 PowerSchool SIS 存取資料，您必須安裝以下應用程式外掛程式 PowerSchool 中，並取得 OAuth 認證遵循下列步驟。 Before SDS can access data from your PowerSchool SIS, you must install the application plug-in below within PowerSchool and obtain OAuth credentials following these steps. 在您的本機電腦上使用下列內容，建立 XML 外掛程式安裝檔案和檔案儲存為 「 plugin.xml 」。On your local computer, create an XML plug-in installation file with following content, and save the file as "plugin.xml". 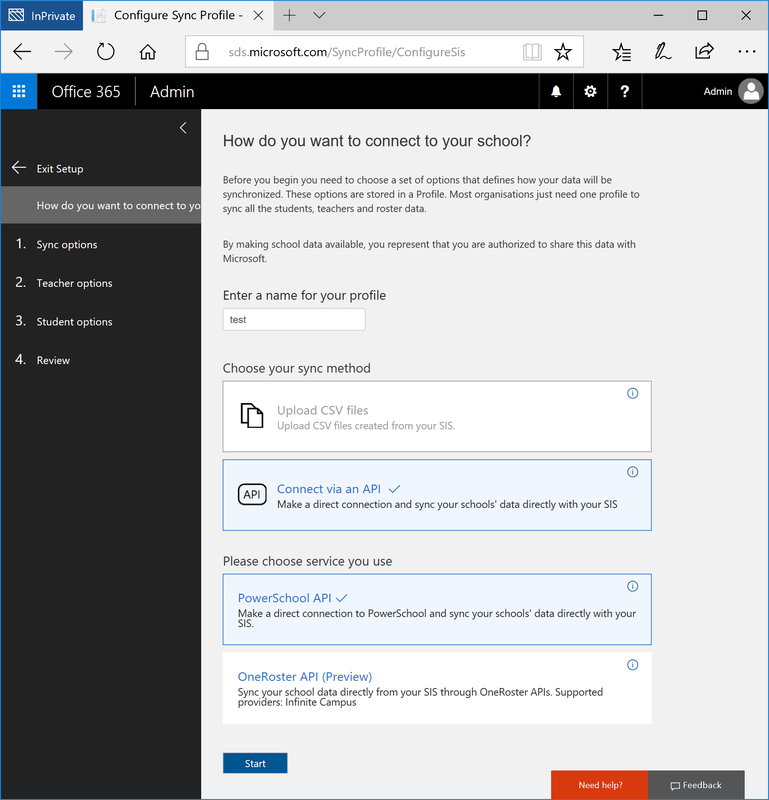 登入 PowerSchool 管理入口網站使用的系統管理員認證。Sign in to the PowerSchool admin portal website using your System Administrator credentials. 輸入或選取您剛建立 (.xml)、 的外掛程式安裝檔案，然後選擇 [安裝。Enter or select the plug-in installation file you just created (.xml), and then choose Install. 外掛程式會出現在 [安裝外掛程式] 區段中 [外掛程式管理儀表板] 頁面上。The plug-in will appear in the Installed Plugins section on the Plugin Management Dashboard page. 確認外掛程式已啟用。Make sure the plug-in is enabled. 如果不是，選擇 [外掛程式管理儀表板] 頁面上的 [啟用] 選項。If it is not, choose the Enable option on the Plugin Management Dashboard page. 在 [外掛程式管理儀表板] 頁面上，確認外掛程式已啟用。On the Plugin Management Dashboard page, make sure that the plugin is enabled. 選擇 [資料組態]，以檢視針對外掛程式所產生的 OAuth 認證。Choose Data Configuration to view the OAuth credentials that were generated for the plug-in. 因此當您建立 School Information Sync 設定檔時，您可以輸入這些認證，請用戶端識別碼和用戶端密碼記錄的值。Record the values for the Client ID and Client Secret so you can enter these credentials when you create your School Information Sync profile. 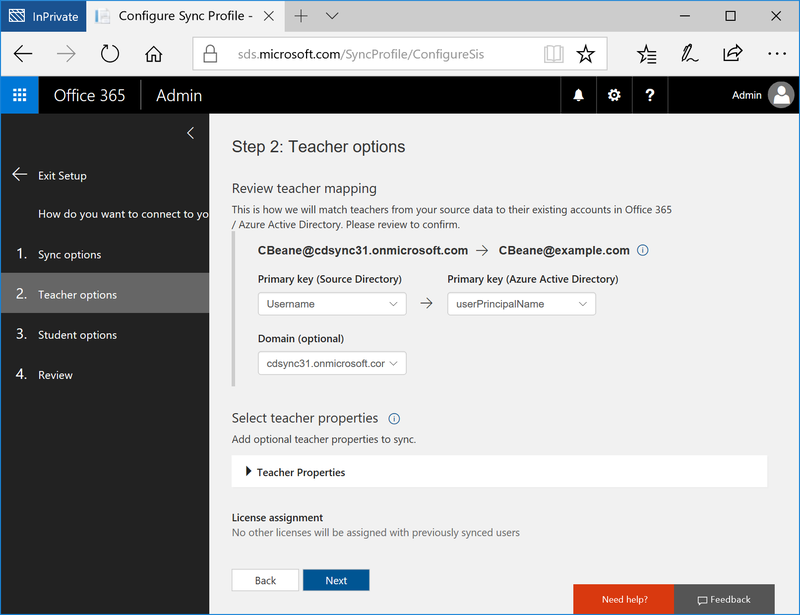 Microsoft School Data Sync 必須能夠連線到您的學校 PoweerSchool 伺服器。Microsoft School Data Sync must be able to reach your school's PoweerSchool server. 若要確保伺服器可存取，請開啟連接埠 80 和 443 從網際網路到 Powerschool 伺服器。To make sure the server is accessible, open ports 80 and 443 from the Internet to your Powerschool server. 若要驗證端點已正確設定，請檢查您可以從網際網路開啟 PowerSchool server 網站頁面。To validate that the endpoints are set correctly, check that you can open the PowerSchool server website pages from the Internet. 例如，在您瀏覽器中，移至 [(https://Powerschool.com/public/)和 (http://Powerschool.com/public/)。For example, in your browser, go to (https://Powerschool.com/public/) and (http://Powerschool.com/public/). 如果您要設定 School Data Sync 的承租人以從 onpremises AADConnect 透過 Active Directory 同步處理，您可能會發現您 miisclient 所示的斷路器數目增加。If you are configuring School Data Sync for a tenant which is synchronized from onpremises Active Directory through AADConnect, you may notice an increase in the number of Disconnectors shown in your miisclient. 這是 Office 365 群組無法同步處理回 AADConnect Metaverse 的結果，而且在內部部署 Active Directory。This is a result of Office 365 Group being unable to synchronize back to the AADConnect Metaverse and on-premises Active Directory. 這些警告沒有任何負面影響您目前的 AADConnect 部署，並只提供參考的附註在產生的同步處理失敗。These warnings do not have any negative impact on your current AADConnect deployment, and only provide an informational note on the resultant sync failure. 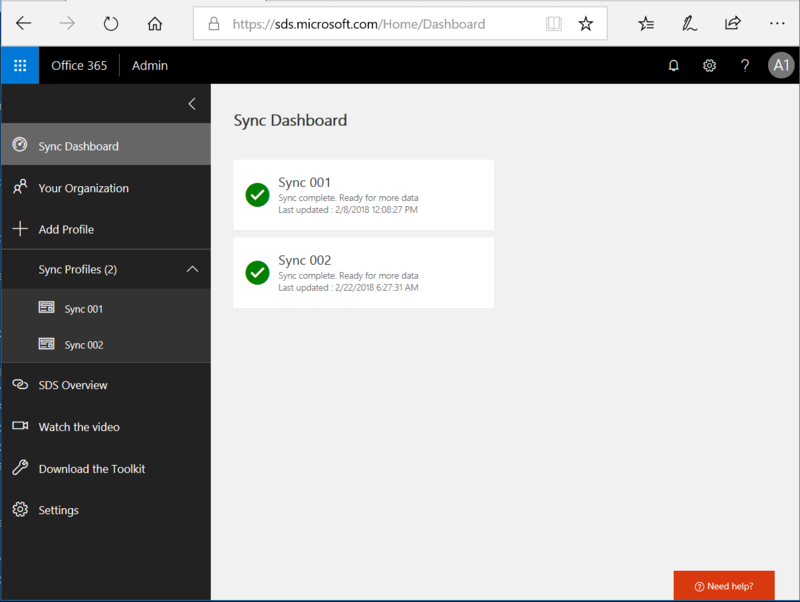 您應該為每個類別建立一個 Office 365 群組啟用同步處理中 SDS，透過 SDS 同步處理之後期望 AADConnect 這些警告。You should expect these warnings in AADConnect after enabling sync in SDS, as one Office 365 Group is created for each class synchronized through SDS. 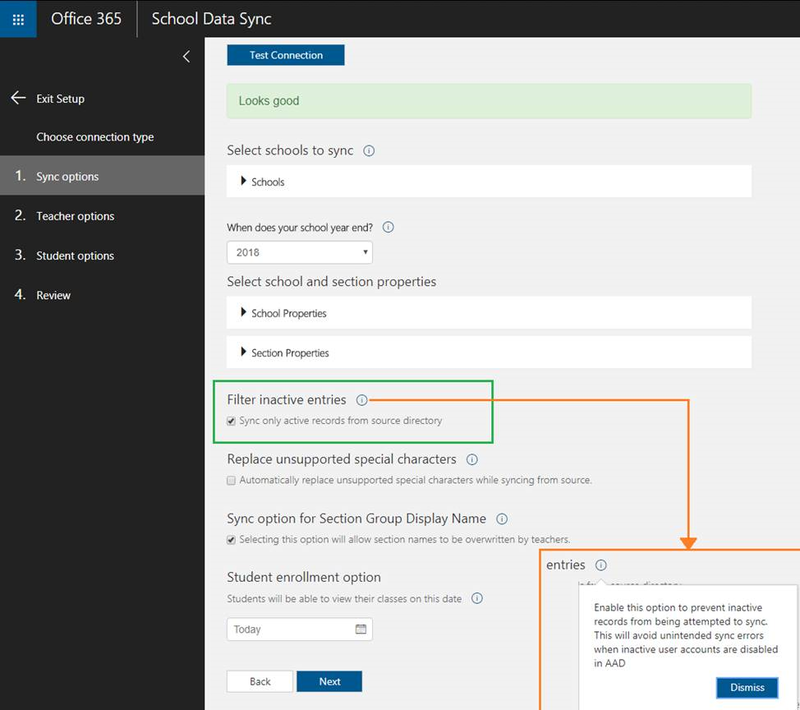 若要存取 School Data Sync 管理入口啟動網頁瀏覽器中，瀏覽至 sds.microsoft.com，並重新登入您的 O365 全域系統管理員帳戶。To access the School Data Sync Admin Portal launch a web browser, navigate to sds.microsoft.com, and then sign in using your O365 Global Admin account. 之後登入時，按一下 [ + 新增設定檔的左側瀏覽窗格，以建立同步處理設定檔。After logging in, click +Add Profile in the left hand navigation pane to create a Sync Profile. 在 [選擇連線類型] 頁面上完成適當的表單。On the Choose Connection Type page complete the form as appropriate. 完成之後，按一下 [啟動]。Once complete, click Start. 名稱這個設定檔-輸入您的同步處理設定檔的名稱。Name this profile - Enter a name for your sync profile. 此名稱將會用來識別在 SDS 儀表板，同步處理設定檔，且無法變更設定檔安裝完成後。This name will be used to identify the sync profile in the SDS Dashboard, and cannot be changed once the profile setup is complete. 選擇您同步處理方法-顯示同步處理方法之間的選擇。Choose your sync method - Choose between the sync methods shown. 如果您正在同步處理使用 PowerSchool API，選取 [連線透過 API] 方塊，然後選取 [PowerSchool API 選項。If you’re syncing using PowerSchool API, select the Connect via an API box and then select the PowerSchool API option. 在 [同步處理選項] 頁面上，選取適當的選項來建立新的使用者或同步處理現有的使用者。On the Sync Options page, select the appropriate option to create new users or sync existing users. 然後完成視頁面上的選項。Then complete your selections on the page as appropriate. 現有的使用者-選取此選項，如果您已建立的每位學生和教師 PowerSchool 中包含在 O365 租用戶中的使用者帳戶。Existing Users - Select this option if you already have user accounts create within your O365 tenant for each of the students and teachers contained within PowerSchool. 每位學生和教師 PowerSchool 中包含的新使用者-選取此選項，如果您想要讓 SDS 建立的使用者帳戶。New Users - Select this option if you want SDS to create user accounts for each of your students and teachers contained within PowerSchool. Web 存取 URL -這是從網際網路存取之 PowerSchool SIS 的基底 URL。Web Access URL - This is the base URL for your PowerSchool SIS which is Internet accessible. 用戶端 Id -這是用戶端識別碼記錄在 [安裝外掛程式 powerschool 的 REST API ] 區段中的這篇文章。client Id - This is the client Id recorded in the Install the REST API plug-in for PowerSchool section of this article. 用戶端密碼-這是本文的記錄在 [安裝外掛程式 powerschool 的 REST API ] 區段中中的用戶端密碼。client secret - This is the client secret recorded in the Install the REST API plug-in for PowerSchool section of this article. 選取要同步處理的學校-這個選項可讓您選取您想要從 PowerSchool 同步處理的學校。Select schools to sync - This option allows you to select the school you want to sync from PowerSchool. 您的學校年度的開始時？When does your school year start? 這是從 PowerSchool 您想要在此設定檔同步處理的學校年份。- This is the school year from PowerSchool you wish to sync under this profile. 僅限 1 學校年可以每個設定檔同步處理。Only 1 school year can be synced per profile. 教師已在多個學校類別-如果您有的教師或學生與多個相關聯學校 PowerSchool 中，核取此方塊。Teachers have classes at multiple schools - If you have a teacher or student associated to more than one school within PowerSchool, check this box. 學校屬性-這些是 SDS 可以同步處理的 PowerSchool 中包含的學校屬性。灰色的屬性是必要的屬性，而且必須要有中的每個學校 PowerSchool 同步處理。顯示的其他屬性是選擇性的並可以同步處理如果您選擇。School properties - These are the school attributes contained within PowerSchool that SDS can sync. 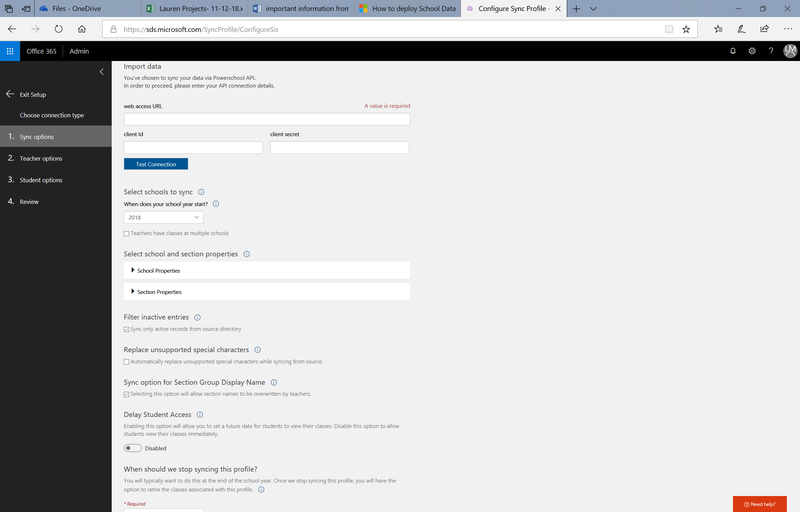 The greyed out attributes are the required attributes, and must be present in PowerSchool for each school to sync. The additional attributes shown are optional, and can be synced if you choose. 區段屬性-這些是 SDS 可以同步處理的 PowerSchool 中包含的節屬性。灰色的屬性是必要的屬性，而且必須出現在每個區段 PowerSchool 同步處理。顯示的其他屬性是選擇性的並可以同步處理如果您選擇。Section Properties - These are the section attributes contained within PowerSchool that SDS can sync. The greyed out attributes are the required attributes, and must be present in PowerSchool for each section to sync. The additional attributes shown are optional, and can be synced if you choose. 篩選不在作用中的內容-選取此方塊只會同步作用中的記錄。Filter inactive properties - Checking this box will only sync active records. 取代不支援的字元-檢查此方塊會自動取代不支援的字元支援的項目。Replace unsupported characters - Checking this box will automatically replace unsupported characters with supported ones. 同步處理選項] 區段中的群組顯示名稱-檢查此方塊可讓教師控制] 區段中第一次同步之後, 顯示名稱，並防止 SDS 覆寫] 區段中 DisplayName 教師所做的變更。Sync option for Section Group Display Name - Checking this box will allow teachers to control the section display name after the first sync, and prevent SDS from overwriting Section DisplayName changes made by teachers. 延遲學生存取-啟用此選項可讓您設定若要檢視其類別的學生的未來的日期。Delay Student Access - Enabling this option will allow you to set a future date for students to view their classes. 停用此選項可允許學生立即檢視它們的類別。Disable this option to allow students view their classes immediately. 何時我們應該停止同步處理此設定檔？When should we stop syncing this profile? -您通常會想要這麼做學校一年中的結尾。- You will typically want to do this at the end of the school year. 一旦我們停止同步處理此設定檔，您將已淘汰此設定檔相關聯的類別選項。Once we stop syncing this profile, you will have the option to retire the classes associated with this profile. 在 [教師選項] 頁面上，選取適當的身分識別比對選項、 確認教師屬性已選取，然後按一下 [下一步。On the Teacher options page, select the appropriate identity matching options, confirm the teacher properties are selected, then click Next. 主索引鍵 （目標目錄） -這是用於 SDS 身分識別比對 Azure AD 中的使用者屬性。Primary Key (Target Directory) - This is the User attribute in Azure AD used for SDS Identity Matching. 觀賞身分識別比對影片如需有關如何選取適當的目標目錄屬性，並適當地設定身分識別比對的教師設定。Watch the Identity Matching video for additional information on how to select the appropriate target directory attribute, and properly configure the identity matching settings for the teacher. 網域 （選用） -這是選用的網域值，您可以新增至選取的來源目錄屬性，以完成您教師身分識別比對。Domain (optional) - This is an optional domain value that you can add to the selected Source Directory attribute to complete your Teacher Identity Matching. 如果您需要符合 UserPrincipalName 還是郵件屬性，您必須包含在字串中的網域。If you need to match to a UserPrincipalName or Mail attribute, you must have a domain included in the string. 您的來源屬性必須已經包含網域，或您可以將適當的網域附加至使用此下拉式清單功能表的來源屬性。Your source attribute must either include the domain already or you can append the appropriate domain to the source attribute using this dropdown menu. 主索引鍵 （來源目錄） -這是在 PowerSchool 用於 SDS 身分識別比對的教師屬性。Primary Key (Source Directory) - This is the Teacher attribute in PowerSchool used for SDS Identity Matching. 觀賞身分識別比對影片如需有關如何選取適當的來源目錄屬性，並適當地設定身分識別比對的教師設定。Watch the Identity Matching video for additional information on how to select the appropriate source directory attribute, and properly configure the identity matching settings for teacher. 在 [學生選項] 頁面上，選取適當的身分識別比對選項、 確認學生屬性已選取，然後按 [下一步。On the Student options page, select the appropriate identity matching options, confirm the student properties are selected, and then click Next. 主索引鍵 （來源目錄） -這是在 PowerSchool 用於 SDS 身分識別比對的學生屬性。Primary Key (Source Directory) - This is the Student attribute in PowerSchool used for SDS Identity Matching. 觀賞身分識別比對影片如需有關如何選取適當的來源目錄屬性，並適當地設定身分識別比對的教師設定。Watch the Identity Matching video for additional information on how to select the appropriate source directory attribute, and properly configure the identity matching settings for teacher. 主索引鍵 （目標目錄） -這是用於 SDS 身分識別比對 Azure AD 中的使用者屬性。Primary Key (Target Directory) - This is the User attribute in Azure AD used for SDS Identity Matching. 觀賞身分識別比對影片如需有關如何選取適當的目標目錄屬性，並適當地設定身分識別比對的學生的設定。Watch the Identity Matching video for additional information on how to select the appropriate target directory attribute, and properly configure the identity matching settings for the student. 網域 （選用） -這是選用的網域值，您可以新增至選取的來源目錄屬性，以完成您學生身分識別比對。Domain (optional) - This is an optional domain value that you can add to the selected Source Directory attribute to complete your Student Identity Matching. 如果您需要符合 UserPrincipalName 還是郵件屬性，您必須包含在字串中的網域。If you need to match to a UserPrincipalName or Mail attribute, you must have a domain included in the string. 您的來源屬性必須已經包含網域，或您可以將適當的網域附加至使用此下拉式清單功能表的來源屬性。Your source attribute must either include the domain already or you can append the appropriate domain to the source attribute using this dropdown menu. 在 [檢閱] 頁面上，確定您已進行適當的選項。On the Review page, ensure you've made the appropriate selections. 如果不需要任何其他變更，按一下 [建立設定檔。If no additional changes are needed, click Create Profile. 學生和註冊 – SDS 同步根據學校關聯及狀態某些學生。Students and enrollments – SDS syncs some students based on school association and status. 教師 – SDS 同步根據學校關聯，某些教師和人員輸入。Teachers – SDS syncs some teachers based on school association, and staff type. 類別和所有年內選取學校的學校-SDS 同步處理。Classes and Schools- SDS syncs all within the selected school year.